So when my sister did her exchange the US, I realised that it was a great opportunity to take advantage of the Black Friday sales. Black Friday coincided with my birthday, so I really splurged on US beauty brands – I wanted to get my hands on products that I cannot find in Europe easily. One of the brands that I have been up obsessed with is Glossier. So far I’m rather impressed with the products. I went for highlighter, eyebrow mascara, transparent lip gloss and a sheer lip balm. I love how they also come in a lovely pink pouch, perfect for liquids when travelling! I am not a highlighter girl, but ever since I bought this highlighter, I am using it every day. It is very hydrating and easy to apply. The hydrating center is made of oil, making sure that your skin stays moisturized throughout the day. It is very easy to apply, very buildable without looking cakey and you can bled easily with the fingers. I usually apply it on my cheek bones temples but also on my eyebrow arch. This lip balm has very sheer finish and is very moisturising. It is perfect for those who prefer to have a slight tint on the lips. The magic of the lip balm is that it adapts to you, so different people can get different colors from the same lip balm! The boy brow seems to be the best Glossier product. It is beauty staple that not only enhances your eyebrow color, but also brushes them and, with the help of the wax, keep them in place. The boy brow is very small and perfect for traveling it is the best way to achieve flawless eyebrows anywhere anytime. A simple classic clear lip gloss is always a must have in everybody’s make-up bag. Just a layer of clear shine can add a bit of sparkle to your make-up. 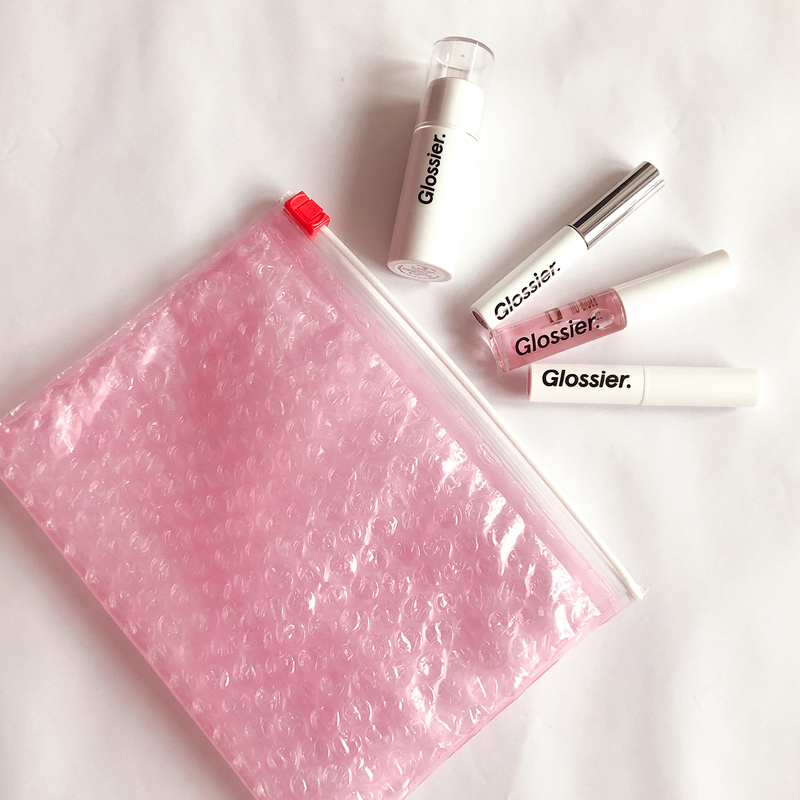 The doe foot applicator feels very nice on the lips and the gloss is keeping the them hydrated thanks for vitamin E.
Have you ever tried any products from Glossier? What are your favorites?